Welcome to Online Quants Test in AffairsCloud.com. We are starting Cumulus Course for SBI PO 2018 Main Exam and we are creating sample questions in Quants section, this type of Question will be asked in SBI PO 2018!!! Directions for question (1 – 5): Study the following table to answer the questions that follow. Some values are missing. 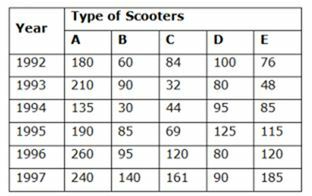 Study the table carefully and answer the questions based on data in table and particular questions. On 1st day, if difference between the time taken by the boat to go upstream and the time taken by the boat to go downstream is 20 hours, find the total time taken by the boat to go upstream and downstream. On 2nd day, if difference between the time taken by the boat to go upstream and the time taken by the boat to go downstream is 45 hours, find the total distance covered by the boat to go upstream and downstream. Downstream speed is 24 km/hr. On 3rd day, if the boat covered half distance upstream with usual speed and other half with double its speed, then it takes 33 3/4 hours less time than usual time to go upstream. Find the total time taken by the boat to go upstream and downstream. On 4th day, difference between time taken by the boat to cover ‘X’ km upstream and (X+120) km downstream is 26 hours. Had the boat covered same distance upstream as downstream, what would be the difference in time taken then? On 5th day, if ratio of speed of boat to speed of stream is 2 : 1, what is the difference between the time taken by the boat to go upstream and the time taken by the boat to go downstream? In which of the following pairs of years was the total production of E-type scooter two lakhs? In which of the given years the total production of all types of scooters was minimum? In which of the given years was the production of B-type scooter close to its average production over given years? In which year the production of D-type scooters was maximum? What was the average production of A-type scooter in all the years?